We have had many requests for Shear Scrapers like the ones used by professionals for smoothing and shaping of the outside of bowls and vessels. It is possible to leave a nearly flawless finish with these tools. The two tools we offer are both 1" wide by 1/4" thick high speed steel. 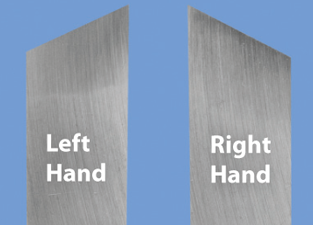 One is skewed left hand (for cutting right to left), and the other has a right hand skew (for cutting left to right). The tools both have 10" Ash handles.